And here's a video tour for your viewing pleasure. On Saturday, I shared about filling our shed with large pieces of wood to dry for the upcoming winter months. In addition to large pieces of wood, kindling is an important part of fire starting. We could split wood for kindling, but plenty of small pieces float in for easy retrieval. In the fall, we store tubs of dry kindling in our floating wood shed. 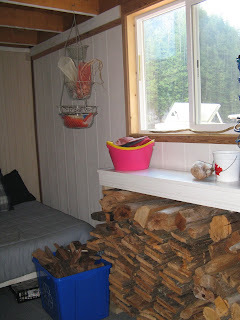 We bring the wood in as needed to replenish the tub next to the wood stove. We learned long ago not to bring the full tubs indoors. We transfer the wood by hand so that mice that might be nesting in the bottom don't take up residence in our cabin. Just as our firewood needs to be replenished throughout the winter, so does our kindling. First we collect it in buckets from around the cabin's float. Next, the wet wood is dumped into our repurposed dinghy. It many not be able to float any longer, but it's leaky bottom makes it a perfect container for drying kindling. There's an island in the middle of the lake. It looks like a beautiful spot to take a kayak or canoe. 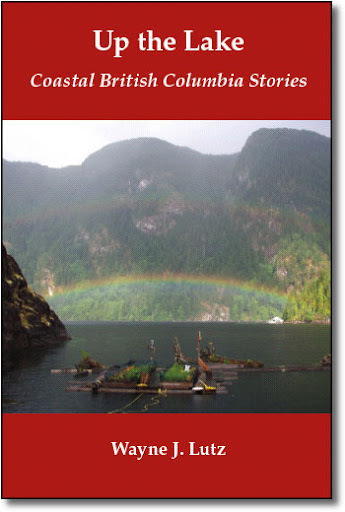 As we sat on the shore, our good friend John told us this story. Hey Wayne and Margy, see that island? One time Eldon and I rode our quads out there. It's a beautiful island to explore. Can you figure out how we did it? We start using our woodstove for cabin heating in November and keep it going pretty much every day through May. That takes quite a bit of firewood. We try to get our woodshed pretty full in the fall when the wood is dry and lighter, but it's never enough to last the whole season. Our floating wood shed has two constraints, the size and weight of its contents. If we put too much wood in, the float logs submerge and saturate. That's bad for the logs, and also lets water get to the bottom of our dry wood. Consequently, we have to use a wood rotation system. This year we were lucky. John redid his cedar deck and gave us all of his old wood. We stored about half of the precut lengths on our log work float. Wayne pushed the float up to the dock and tossed the wet boards across. I tossed them into the woodshed and stacked them criss-crossed so the wood would dry quicker. We have enough dry wood to last another month. By then, our wet would should be ready to use. We don't get snow very often, so I love it, especially when we are at the cabin. Almost as good are the clear blue skies after the storm. Above is a view of my floating garden with Goat Island beyond. On January 7, 2010, I was surprised to find my garden float featured on Lloyd Kahn's blog. I left a comment thanking Lloyd, and not long after I received a unique request. 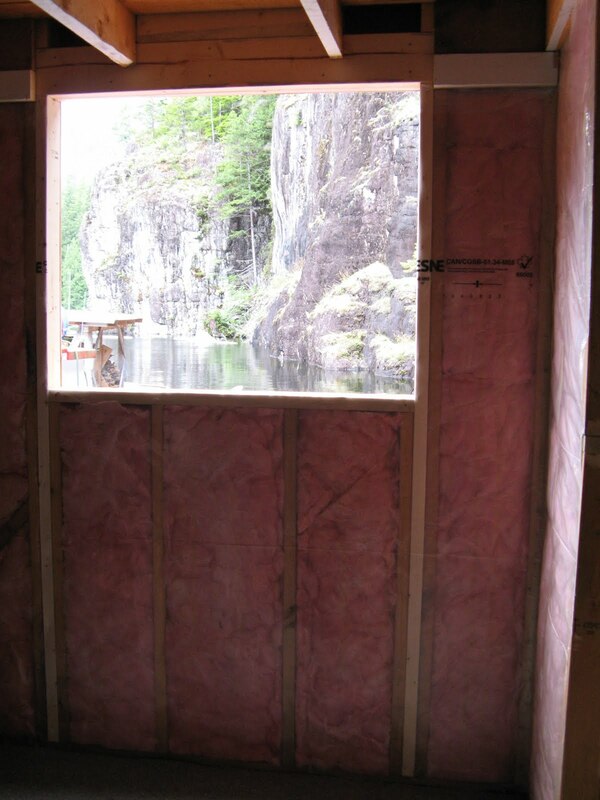 Lloyd wanted to feature our float cabin on Powell Lake in a new book he was putting together about tiny homes. I was thrilled. Two years later, Tiny Homes: Simple Shelter by Lloyd Kahn is finished and available for purchase. I've already got my copy and it's an amazing book. It has 1,300 full-colour photos of a wide array of small homemade shelters. Check out pages 210-211 for Our Little Cabin up the Lake. Last week in Coastal BC we had storms move through that left us with several centimetres of snow on the ground. I was at the cabin during two of them. Here are the results. Where we live the snow doesn't last much more than a week, sometimes less. Dress around the cabin is pretty casual. Summer is shorts and T-shirts. In winter, I bring out sweatsuits and slipper socks. I've had this pair for several years now. The tops are fine, but the soles have worn through several times. I've had to patch the holes with cotton cloth inside and out more than once. A cold spot on the ball of my foot told me I had a new hole developing. I hated to give up just yet, so I decided to give them one more lease on life. I rummaged in the rag box and found old flannel pillow cases. I used the finished edge and there was just enough cloth in one case to make two new soles that are four layers thick. I sewed the new soles in place with a tight whip stitch. I turned under all the raw edges, and rounded the square corners into the shape of my foot. My favourite slipper socks have been saved from the trash. It feels good to put them back in use for another winter season. makes dark silhouettes of the trees reflected on the calm waters of Hole in the Wall on Powell Lake. 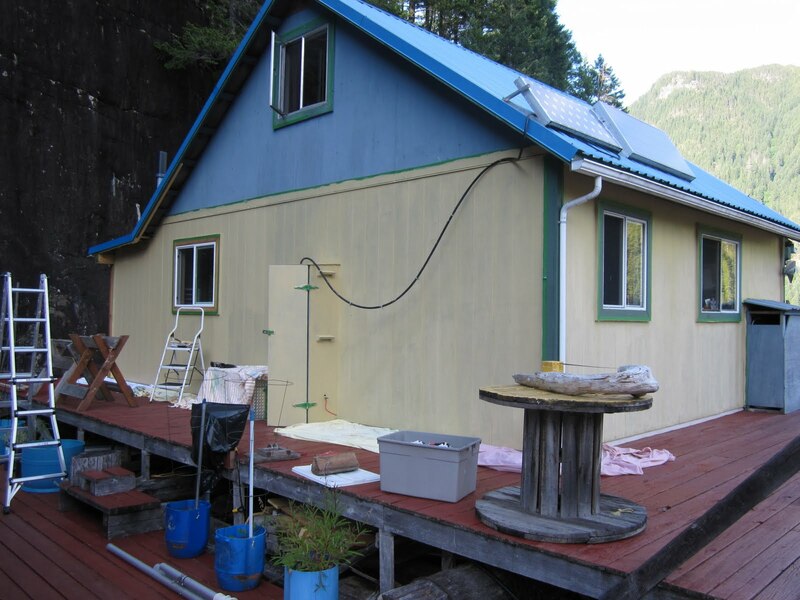 Our float cabin is off the grid. We generate our own electricity using solar, wind, and thermoelectric power, with a back-up gas generator for those short, cloudy winter days. We have chosen not to have television or Internet at our cabin, but we love to listen to the radio. Wayne did research several years ago and we purchased a CCRadioPlus from the C. Crane Company. It's been a perfect radio for the cabin. It has a built-in battery charger and the four D-cell NiMH rechargeable batteries last for weeks between charges. It has AM, FM, Weather, and TV audio channels. Of course, the TV reception will discontinue once the digital transition is complete. We decided to treat ourselves to a new CCRadio-2 for Christmas. The old one will stay upstairs, and the new one will be for downstairs and outdoors use. The models are similar, except TV audio has been replaced with 2-Meter Ham. The built-in battery charger has also been omitted. That was a huge surprise. At least our old model can be used for charging the batteries for both sets. We're very happy with this product. We can "rock on" with local SUN.FM or keep up with what's happening worldwide. And of course, the fact that it runs on rechargeable batteries makes it perfect for cabin living. Wednesday I flew from Powell River to Vancouver. The flight was delayed about two hours because of a snow storm moving through Coastal BC. 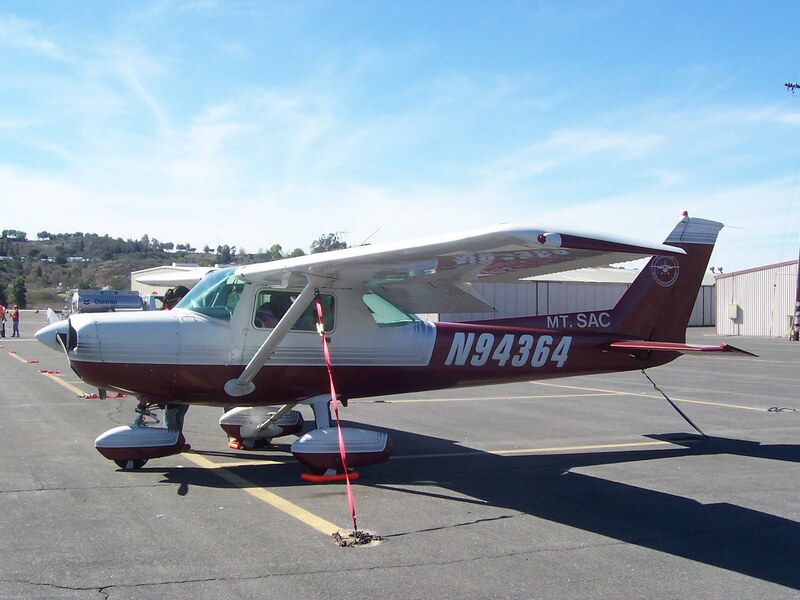 The pilots of Pacific Coastal Airlines are used to the varied flying conditions in our area. 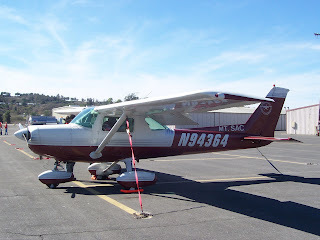 Their experiences gives me confidence in flying in all sorts of weather. Walking on slippery wet, snowy, and icy decks (not to mention docks, sidewalks and roads) can be a huge challenge this time of year. The most recent snowstorm up at the cabin had Wayne and I reaching for our Yaktrax. Yaktrax Walkers are unique, easy to slip on traction devices for your shoes. They are made in the form of a flexible plastic mesh covered on the bottom with rust resistant metal coils on the bottom. They work like chains do on a car, making it easier to walk on slippery surfaces. Wayne leaves his Yaktrax on a spare pair of shoes so they are even easier to put on to go outdoors. While they are meant to be used outdoors, they can be worn inside if you don't have a delicate floor or carpet. That makes them perfect for cabin use. Yaktrax come in a variety of formats. We have the original Walker version ($20). They also have a Pro version ($30) with over-the-foot straps to hold them in place, an Extreme version ($60) that has mini-chains and spikes on the soles for even better traction, and the new SkiTrax ($20) for use with ski boots. When we remodeled to add our new bathroom, we lost the window in the guest bedroom. It has always been the darkest room in the cabin. That's because the window faced north where our massive granite wall is located. So we asked John to cut us a new window facing west while he had all his tools handy. First, the interior paneling had to come down. That was fine with me because moisture stained the bottom. Then he removed the insulation and reworked the moulding which provides support for the floor of the upstairs loft. John used the studs to size the width. My wood storage shelf, which would go underneath, determined the height. A few cuts and I sort of had a window. Once John got the frame completed, he took measurements to Rona and ordered a custom window. 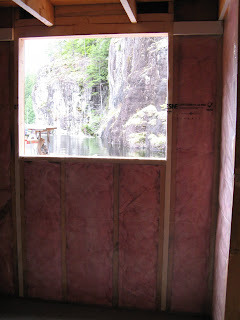 In the meantime, he put the exterior wall back up to keep out bugs and critters. We replaced the interior paneling with primered pine sheets like the bathroom and painted with matching mould resistant semi-gloss off-white paint. That helped to brighten up the room. Here you can see the new window on the left during our cabin painting project. Now we get a lot more light in the guest bedroom, the adjacent bathroom, and even out into the living room area. And a west facing window gives us light later in the day when we need it most. On Tuesday, I shared how propane lights up our nights. Here's another way propane helps us during the winter. We love our wood stove, but at night it burns down and the cabin cools. I'm snug under our big comforter, but Wayne's a night creeper. When he gets up alone, sometimes he uses our propane heater for a warm blast right on his feet as he sits on the sofa downstairs. We researched portable propane heaters and purchased a Mr. Heater Big Buddy. There are three sizes in the Buddy series, we chose the largest. This model is designed for up to 400 square feet. In addition to the cabin, we use it in Gemini (Wayne's Writer's Retreat boat), and have taken it cruising in our Bayliner for overnight lake trips. The portability is a nice feature. The Big Buddy has two sides that operate independently to manage the amount of heat. It can hold two 16.04 oz. 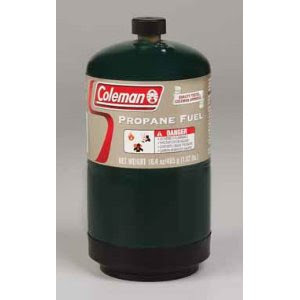 Coleman propane bottles. 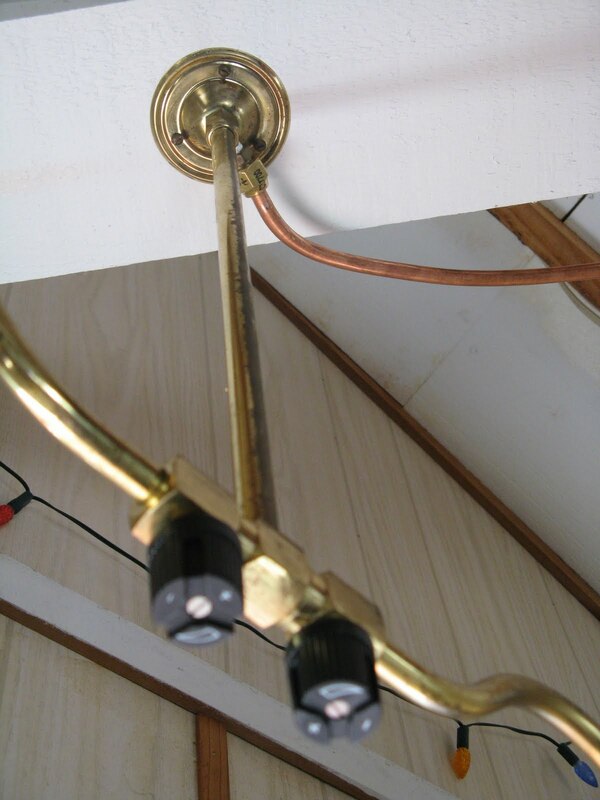 For longer (and less costly) operation, it can be connected with a hose to an external 20 lb. tank (located outdoors). Built in safety features include an automatic low oxygen shutoff system, and an accidental tip-over safety shutoff. And it's approved for indoor and outdoor use. We've probably all looked up over a crowded beach, parade or fair to see a small plane towing a banner. What we don't expect is to see our name up there in the sky. Living on the water in a float cabin gives me plenty of opportunity to capture watery shots. It's tough in winter to generate enough power with solar panels to run electric lights (even LEDs) for more than a short time each night. Even on a sunny day, at this time of year we only get about two hours of direct light. Our winter alternative is propane light. We have a double chandelier in our kitchen that lights up our great room. It's not bright enough for reading, but plenty to do general tasks. 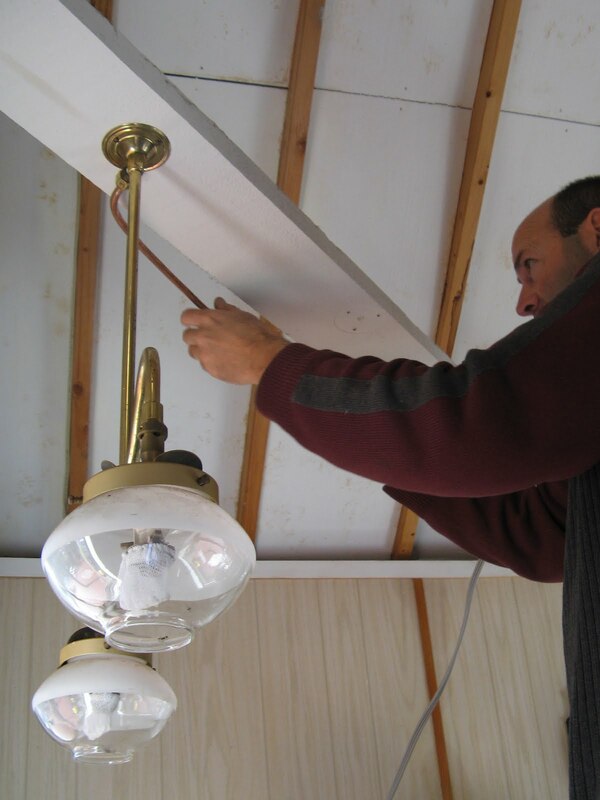 When we did our kitchen remodel, we had to move the light to make room for the new propane refrigerator. We asked our good friend John to help us out for two reasons. One, he has the proper tools, and two, he knows what he's doing. Propane is a safe energy source if it is used carefully. The primary danger is a leak, allowing propane to sink and collect in low areas, creating a fire and explosion hazard. Propane is odourless, but an additive gives it a “rotten egg” smell to warn if there's a leak. Good thing! 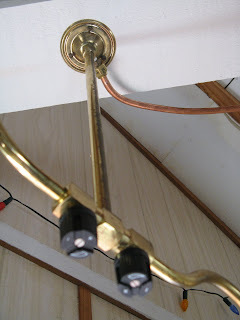 The new position for the chandelier was just far enough away to require an extension of copper tubing and a new fitting. A dab of liquid soap lets you know if the seal is tight. Any telltale bubbles, and you need to redo the connection. Twist knobs make it easy to turn the propane on and off. This chandelier has two lights with separate controls. We usually light just one. Propane fixtures use mantles just like Coleman lanterns. And lighting them is very similar. Decorative glass globes protect the fragile mantles from damage and help distribute light downward.